Fashionable flair. You'll shine in this Long Rope Baroque Shape Multicoloured Freshwater Pearl Necklace. 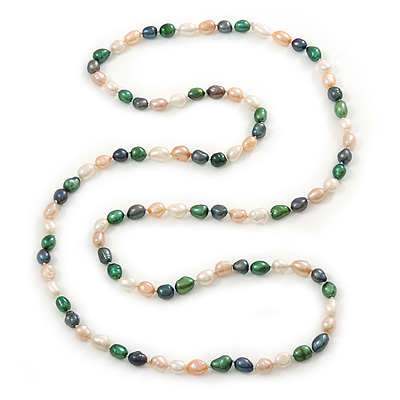 Featuring an extra-long single strand, made of Baroque shaped freshwater pearls in hues of green, black, white and pink. Necklace approx. 116cm long and an easy-to-wear, no fastening so can be slipped over the head. Very versatile - wear them long, wraparound the neck twice, tie a knot! Just enjoy! A great way to add some femininity to any outfit!